As probably everyone already know, to turn the bike on/off we use the ignition switch or the red kill switch button. Of course it may happen that the kill switch will stop work properly – some cable can tear apart or a contact can corrode. 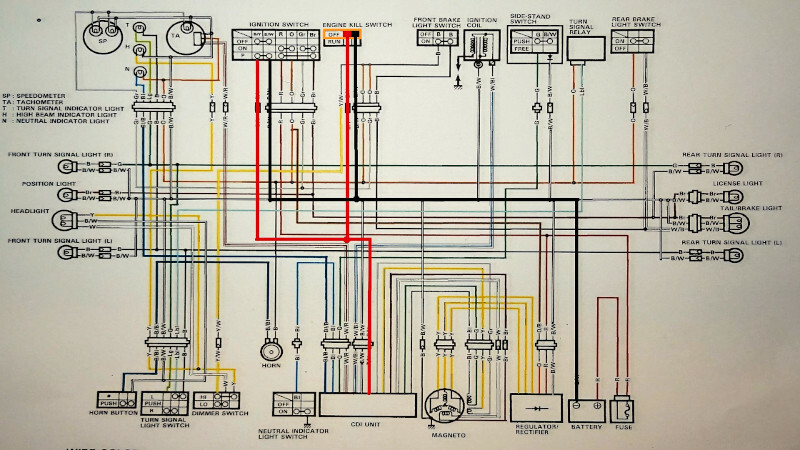 So today I’ll write a bit about checking the electrical system in terms of those switches. As in our recent tests, we will just use the service manual and our favourite tool so far – the multimeter. This time we’re interested in the black with yellow tracer cable. It goes from the CDI unit and branches to the ignition switch and to the engine kill switch. We coloured this wire red. The second interesting cable is the black with white tracer cable. It goes from the ground terminal of battery and branches to the ignition switch and the kill switch. We marked it black. Ignition switch and kill switch connections on the wiring diagram. If you look closer at the diagram, you can notice that our switches (the ignition and the kill switch) short the signal cable to the ground in OFF position. Both are connected in parallel, so even one of them in OFF position is enough to block the engine start. Now let’s look from the ignition switch point of view. Ignition switch and kill switch both in ON position. Of course, we can use ground available at the CDI unit or wherever you like it. We found the battery ground terminal the most comfortable spot. The second probe should be pinned to the only one 3-pin contact around the CDI unit. The interesting us wire is the black with the yellow tracer one. On the wiring diagram someone drew this wire as if it is located on the contact edge. While in reality it’s in the contact center! So look for the colors carefully. 1. Ignition OFF, kill OFF – we expect resistance like in the closed circuit, so just few Ohms. 2. Iginition OFF, kill RUN – we expect resistance like in the closed circuit, so just few Ohms. 3. Ignition ON, kill OFF – we expect resistance like in the closed circuit, so just few Ohms. 4. Ignition ON, kill RUN – resistance like in the open circuit, so beyond the range. Just to be sure we can play around a little with switches and turn them on and off few times to see what’s happening on the multimeter, to be sure we can notice the resistance value change. So try to jump a couple of times from the setting 2 to the setting 4 and back, etc. Every time we should note a change on the multimeter. In our DR everything was OK here and the ignition switch and the kill switch aren’t the one to blame. So in the next post we will focus on another suspect – the neutral switch. First time here and also troubling with the DR electrical system and spark? 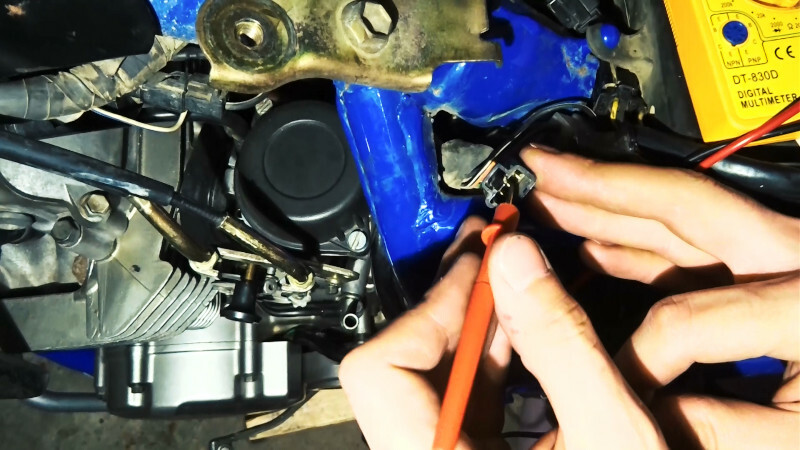 See the ignition coil test, the power source coil test or the pick up coils test.